It’s November and once again I’m blogging as many Thanksgiving-themed recipes I can squeeze into a month. Last week I got started with cranberry sauce. What’s left but dessert? Okay, being real, I’ve got lots more between cranberries and dessert, but isn’t dessert one of those things that require a lot of planning? If not that, isn’t it at least your favorite dish to anticipate for as long as possible? Whatever the case, my second Thanksgiving related post of the month is dessert, and a damn good one at that. I’ve wanted to make a vegan pecan pie for a while now. For some reason I thought it’d be easy. 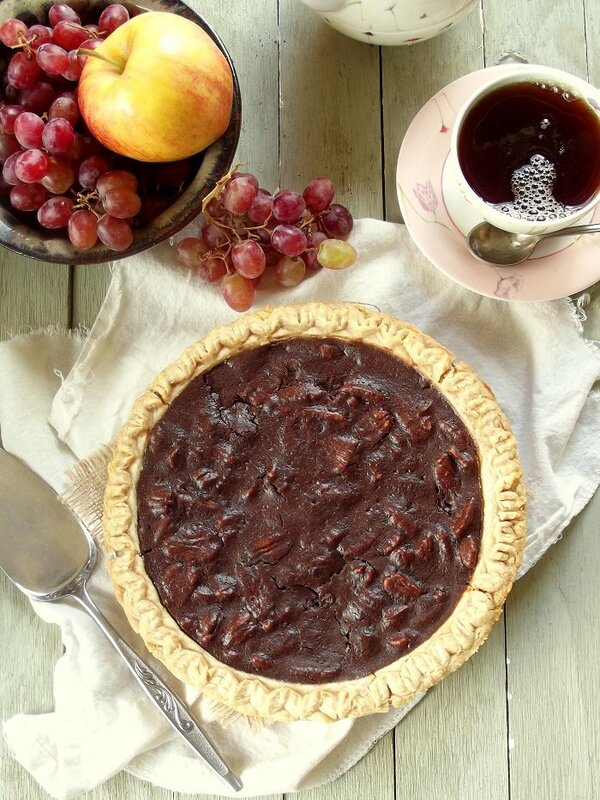 Pecans are already vegan, vegan pie crust is easy enough to make/find…so, it couldn’t be that tough, right? Then I read this. Apparently creating a vegan pecan pie isn’t as easy as I thought. I guess I’d forgotten the one nearly essential non vegan-component to pecan pie: eggs. You can’t really blame me – it’s not like they call it “egg pecan pie,” which would be helpful, if you ask me. So, I did the smart thing and copped PPK’s logic. I used tofu. Since extra firm silken tofu can be hard to come by, I tried using regular old extra firm tofu. It worked. Once you run that stuff through the food processor it becomes completely smooth. 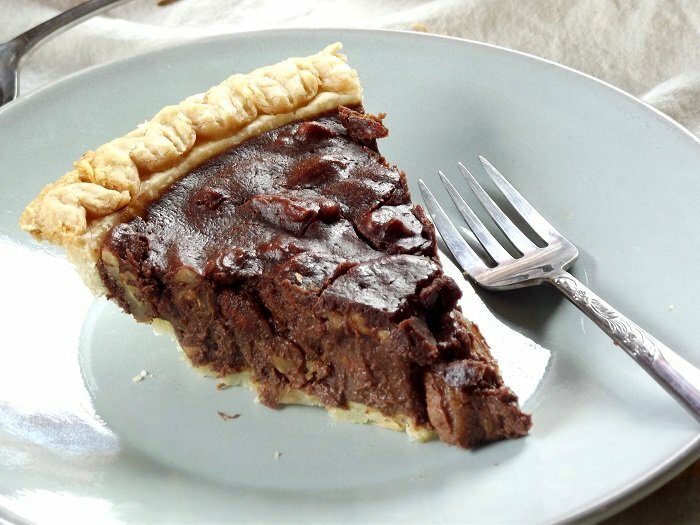 The other thing about this pie: it’s a pecan pie of the chocolate variety. 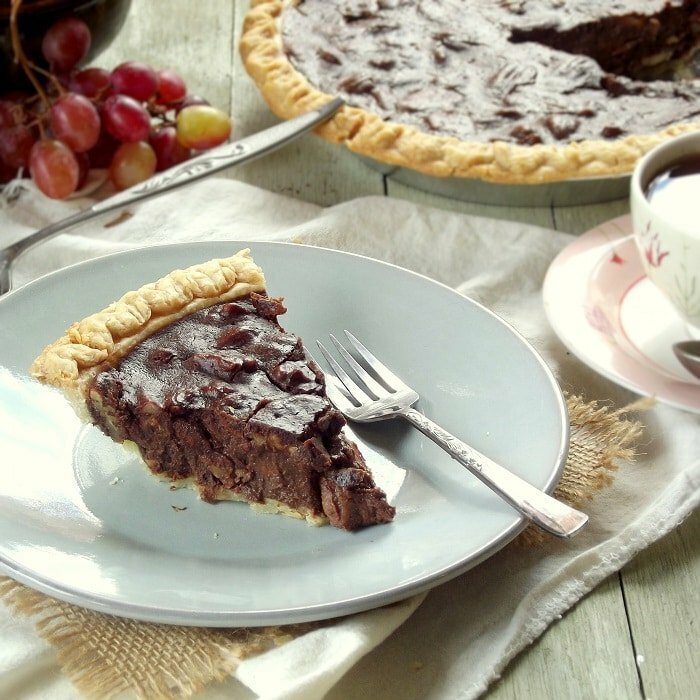 I’ve seen a few chocolate pecan pies floating around Pinterest, but not a single vegan one. I love chocolate in just about anything, so I figured I couldn’t go wrong with it in a pecan pie, and I didn’t. There are very few things that I can imagine would be less tasty with the addition of chocolate. Vegan pecan pie filling, it seems, tastes something like cinnamoney pecan-studded fudge. That’s what I thought anyway. Not to far from the chocolate fudge I got at the Jersey shore as a kid. In other words, very rich, which means you need not concern yourself with creating a vegan whipped cream topping. 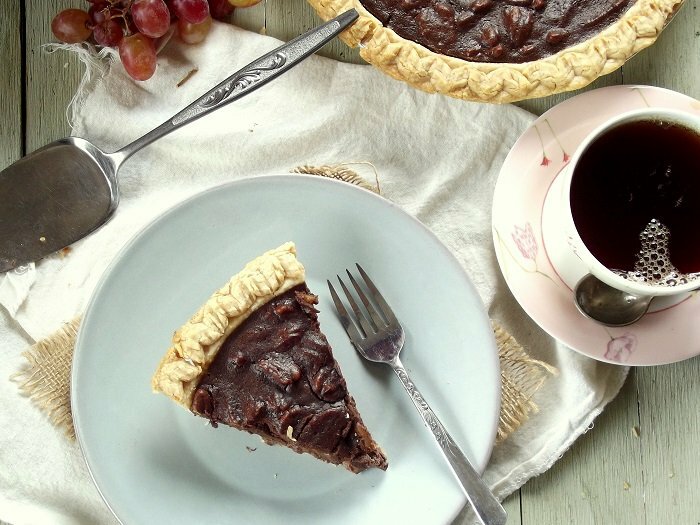 This vegan chocolate pecan pie is made with a rich, fudgy, pecan-packed pie filling that's loaded with chocolate and has just a hint of cinnamon. Stir brown sugar and maple syrup together in medium saucepan. Place over medium heat and bring to a simmer. Lower heat and allow to gently simmer for about 10 minutes, stirring frequently, until thick and syrupy. Remove from heat and stir in coconut oil and vanilla. Place tofu, coconut milk, cocoa powder, cornstarch, cinnamon and salt in food processor bowl. Blend until completely smooth, stopping to scrape down sides of bowl as needed. Stir tofu mixture into brown sugar mixture until completely blended. Fold in pecans. Pour mixture into pie crust. Bake 40 minutes. Adapted from Post Punk Kitchen's Maple Pecan Pie. I’ve never had pecan pie, but with a recipe as good as this I may have to try some! Can I substitute cacao powder with an 85% chocolate bar? If so, how much do u think I should use? You probably could, but it might get a little complicated, as you’d also need to reduce the amount of coconut oil and sweetener. This guide might be helpful with the amounts. I would suggest melting the chocolate and stirring it into the brown sugar mixture at the end of step 1. Good luck, and I’d love to hear how it works out if you do try it this way! Looks delicious! Did you use canned coconut milk, or the coconut milk beverage? Hi, can I sub other neutral flavour oils like grapeseed oil etc for the coconut oil? You could probably get away with substituting another kind of oil, but applesauce seems a little risky – the oil gives it a smooth texture, and I think applesauce might throw that off a bit. Enjoy! Does this recipe call for canned coconut milk? Or the kind a carton? It uses full fat canned coconut milk. I started being vegan for health reasons, and astonishingly I’ve lost 4 lbs in 2 weeks, after trying all sorts of diets and exercise over 4 years and only gaining weight… I’d actually given up on losing weight! I don’t think this recipe would aid in my weight loss, but I think I’ll save it for Thanksgiving! I’m glad to hear about your success! And probably not! Lol. I think Thanksgiving is acceptable as a cheat day. :) I hope you enjoy! IS there a way to test the pie is finished cooking? A look, or clean knife poke? My knife came out clean after 4min, but I’m not sure the pie looks finished. Thanks! It’s been a while since I made this one! But I think the pie should start to look set in the center. It does firm up as it cools too, so don’t worry too much if there’s still some give in the center.